Santa Maria condominium located in the Brickell area of Downtown Miami was completed in 1997 and is a Ugo development by architects Revuelta, Vega, and Leon. Floorplans are diverse in this development and range from two bedrooms all the way to seven bedrooms and square footage ranges from 2,100 to over 10,000 square feet. 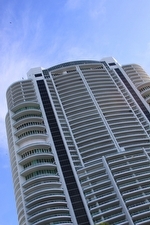 Santa Maria stands 54 stories tall and contains 174 units. Its’ floorplans, location, and appointment make it an enduring luxury property in Miami. Santa Maria is a waterfront property situated between Brickell Avenue and the Biscayne Bay. The views from these residences are some of the finest in Brickell. Residences offer floor to ceiling windows and deep balconies to further enjoy the view and interiors have the finest finishes and fixtures, many of which are updated. The amenities at Santa Maria are diverse with rich history. The Santa Maria Clubhouse is a restored mansion for residents exclusive use and is a 6,000 square feet. Other amenities include a bay front pool, marina, fitness center in the sky, billiards, 24 hour security, business center and play room. The development is also flanked with impeccably maintained gardens. Brickell is known as the Manhattan of the South. It is the financial district of Miami and is separated from downtown by the Miami River. Brickell living is as close to city living as it gets in Miami as there is immediate access to public transport, the Metro Rail, and dining and shopping is all within a short walk. Mary Brickell Village is an informal center of Brickell that offers lounges, gourmet dining, and shopping, and the delights of South Beach are just a 15 minute drive east. The Miami International Airport is under 15 minutes for those who are making a longer commute. Santa Maria is one of the few developments with extensive grounds in the heart of the city directly on the bay. Fitness center includes a state of the art aerobics cardiovascular theater and aerobics sports activities for heart healthy goals.